Fiction – Kindle edition; Vintage Digital; 272 pages; 2011. Good old-fashioned storytelling lies at the heart of Touch by first-time author Alexi Zentner. Set in the icy wilderness of Canada in the early 20th century, the tale is ripe with adventure, hardship, tragedy, murder, romance — and dark fairy tales. Oh, and there’s a teensy bit of cannibalism, too. Spanning several generations, cut and spliced into interwoven narratives that jump backwards and forwards in time, Touch is told in the first person by Stephen, a 40-year-old Anglican priest returning to the place of his birth, where he is to take over the local church from his step-father. Or, as Stephen puts it, “to live in the shadows of my father and my grandfather in a logging town that has been drained of young men headed off to fight in Europe for the second war of my lifetime”. As it happens, Stephen’s elderly mother is on her death bed, and he sets to work writing her eulogy for her up-coming funeral. As he sifts through his memories, trying to find the right words to write, he recalls events — and stories — from his own life and the lives of his relatives. Chief among these is the death of his father and his younger sister, Marie, when he was 11 years old. This tragedy had a marked impact on Stephen’s life, but the return of his grandfather, Jeannot, left just as much of an impression. In fact, Jeannot is the patriarchal heart of this novel, the character whom everything ultimately revolves. It is the stories he has passed down, across the generations, that Stephen remembers, and, in turn, shares with us, the reader. Legend has it that a teenage Jeannot — who “had quit his training for the Catholic priesthood, left the orphanage, and traveled across the whole of Rupert’s Land” — founded the town of Sawgamet when his dog discovered a nugget of gold as they were passing through. This sparked a gold rush and the town quickly grew in size. But Jeannot was clever and knowing that the gold would eventually run out, he set up a lumber company that helped cement his fortune. Men I knew had been killed by falling trees, had bled to death when a dull ax bounced off a log and into their leg, had been crushed when logs rolled off carts, had drowned in the river during a float. Every year a man came back dead or maimed. My chest started to pound with urgency. I was thinking of all of the things that might lurk — the dangers of the woods: bears and wolves — but I had not expected it to be something as innocuous as the mountains that always loomed above. And if it is not the mountains or the never-ending wall of trees, the woods are also populated with dangerous creatures. In Australia, we contend with snakes and spiders and the mythological bunyip, but in the Canadian wilderness there are bears and more — the wehtiko (“a man turned into a monster as a punishment for cannibalism”), the ijirait (also known as shape-shifters), the loup-garou (werewolf), the mahaha (a demon, from Inuit mythology), the adlet (a blood-drinking monster, also from Inuit mythology) and the qallupilluit (also known as a sea witch). I looked up to see the creature — I could not tell if it was a man or a woman — standing above me, its scaly skin fish-pale and bumped, mottled like it had been submerged under the water for a very long time. It had a large pouch on its back and stringy hair, and despite its milk-white eyes, the creature stared directly at me. The creature took a step toward me with unmistakable menace; it grabbed my wrist and dove into the water, pulling me after it. There is something about clear nights in the winter, the perfection of snow and ice in the light from the stars and the moon that always reminds me of the existence of God. When it’s cold enough, the sky seems to empty, and there is an infinite darkness, a sense that there is something unreachable and never-ending, something past the idea of heaven. As you would expect from a novel narrated by a priest, there is a (slight) religious element to the story. Stephen has been damaged by events, not just the loss of family members, but of his unspoken time “behind the lines as a chaplain when we took Vimy Ridge and held Hill 70” during the Great War. Despite this, he claims that “my whole life is, in some ways, about faith”. Indeed, it is the stories of his family’s history and of the town’s history that he takes on faith — he doesn’t question their validity, although he is aware that there are gaps in his knowledge “that I cannot fill with anything other than speculation”. In part, Touch is about loss — loss of family, loss of property, loss of life — but mostly it is about how we separate myth from reality, fact from fiction, experience from logic, and faith from doubt. How do we unravel the stories from the past in order to understand the stories we are writing for the future? And while the supernatural elements in the text occasionally troubled me — there’s a touch of magic realism at work here, and I’m not much of a fan of that genre — I loved the fairy tale element. There is an especially compelling story about a golden caribou (depicted on the cover of the UK edition) that will stay with me forever. On the whole, I have to say I loved this book. It is a gorgeously absorbing novel, perfect to curl up with in your favourite reading place. 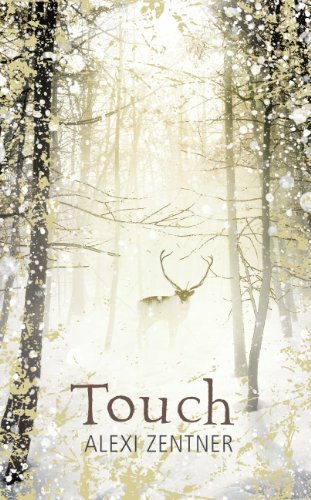 Touch has been longlisted for the 2011 Giller Prize. For another take on this novel please see KevinfromCanada’s review. I want to read as many books on the Giller long list as I can and my library actually has this one. Thanks for a great review. This sounds SOOO good! Even though I’m trying not to put in more hold requests right now, I couldn’t resist when I saw my library had it. 🙂 Anyway, you completely sold me and I can’t wait for it to arrive at my branch! Thanks for the review! I’m not particularly religious but tend to enjoy books that deal with subjects of religion or faith. I like the extracts you gave as well, so may give this one a try. Your library is obviously better than mine! I love my library, but when it comes to Giller longlisted titles — and even Booker longlisted ones — it draws a blank. As you might have gathered by my review, I really enjoyed this one — definitely a book worth staying in for! One of the interesting aspects of this book is the way that Zentner explores different ideas about just what “faith” represents. Kim has offered some hints on the wide range that he addresses (and avoided spoilers) — as one who liked the book as much as she did, let me assure that (at least for me) he delivered on that front. Thanks for your comment, Andrew. The religious/faith element is really a minor component, but it’s an interesting one nonetheless. As KevinfromCanada points out, Zentner explores what faith represents to different people — and that’s one of the more rewarding aspects of this novel. I think you will really like this one, Eva — or at least I hope so. Do come back and share your thoughts once you’ve read that library copy. The book I’m reading now, Annabel, by Kathleen Winter has a very similar cover – also takes place in wintry Canada! For me, this is one of the more readily recommendable of the Giller longlist. Even though I know that there are lots of readers who, like you, aren’t necessarily fond of the magical realism in fiction, something about the way these elements are incorporated into this novel makes them seem not only natural but simply wonderful. I also love what it does with the idea of story-making. The way you’ve summmarized it feels spot on: “it is about how we separate myth from reality, fact from fiction, experience from logic, and faith from doubt”. Nicely done! Agree entirely — this book still remains my favourite from the Giller longlist. It was beautifully written and the story was so gripping and magical and very visual. I just finished reading and “reviewing” this book (it is actually more of an emotional response). I just adored it. Lovely and informative review you have written that captures the story so well! So glad you enjoyed this book, Terri. I have fond memories of it… a truly magical tale.